Holistic prenatal care that is customized to meet you and your family. Just say no to “one size fits all” care! 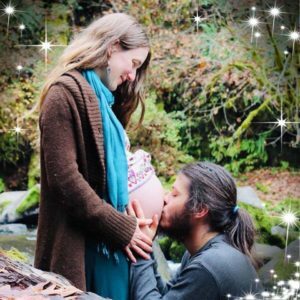 You and your midwife Ash Johnsdottir will meet, develop a relationship, and support the optimal health of your pregnancy with holistic, modern prenatal care. All prenatal appointments included, no hidden fees! Give birth in the privacy of your home with a midwife. Your midwife Ash and her assistant will carefully (and unobtrusively) monitor and care for you and your baby while you labor undisturbed at home, give birth, and welcome your newborn to the world. Complete postpartum care that supports the demands of new motherhood, caring for both you and your newborn, and breastfeeding support and guidance- all from your midwife. All postpartum appointments included, no hidden fees! Most private insurance plans cover midwifery care, and our insurance biller can verify your benefits and handle all the details for you. For clients with Oregon Health Plan, we bill insurance and the complete care package is covered. It’s standard for us to draw up financial plan that is tailored to your family’s budget, allowing you the option to make payments. Please don’t hesitate to contact us to ask about pricing, insurance, or if you have any other questions. Schedule a Consultation and book your Pregnancy & Home Birth Care Package with Ash Johnsdottir, BSM CPM LDM. If this isn’t your first pregnancy, you may know how rushed the typical prenatal visit is (after an endless amount of time spent in the waiting room of course). With me, the typical appointment lasts an hour, so we have more than enough time to address any concerns you may have in addition to the the typical clinical assessments. I also don’t schedule appointments back to back, so my clients don’t get stuck waiting around. Blood is drawn and samples are collected in house, saving you an extra trip to the lab. Everything from the standard prenatal tests and PAP smears, to state of the art genetic testing is offered. And not just for you! We offer newborn metabolic screening for babies as well. An urgent circumstances at 3 AM? My clients call my cell phone and talk to me instead of an answering service or a faceless machine. Browsing the supplement aisle and wondering which prenatal vitamin to choose? My clients can text me instead of sifting through google. Enjoy care that is truly accessible to you throughout your entire pregnancy and postpartum period, rather than just at appointments. All clients get access to our 24/7 client portal with exclusive resources and content. And because we chart with state of the art EHR software instead of paper charts, you’ll always have secure electronic access to your (as well as your new baby’s) personal health record & complete chart from your pregnancy. I see women from all types of lifestyles and backgrounds- athletes/fitness professionals and mothers who work in a cubicle and haven’t see the inside of a gym since high school. I am honored to have worked with families from an incredible array of religious and cultural backgrounds, from both traditional and nontradtional families. Ready to talk to the midwife?